In Spring 2015, as part of our Grow Around the World project, 70 London schools joined our school's experiment to see if Oca could rival the potato on their school dinner tables! Oca (Oxalis tuberosa) originated in the Andean Highlands. It was taken to other parts of the world in the 19th century as an alternative to the potato, and has been grown in Europe since the 1600’s. Oca tends to have a slightly tangy lemon taste. • Send us their Oca recipes for publishing on our website! For those of you who were lucky enough to order your Oca, we hope you are having fun growing. Keep us posted with your experiment on Twitter and Flickr! Download our Grow Around the World school activities pack for Oca hints and tips. 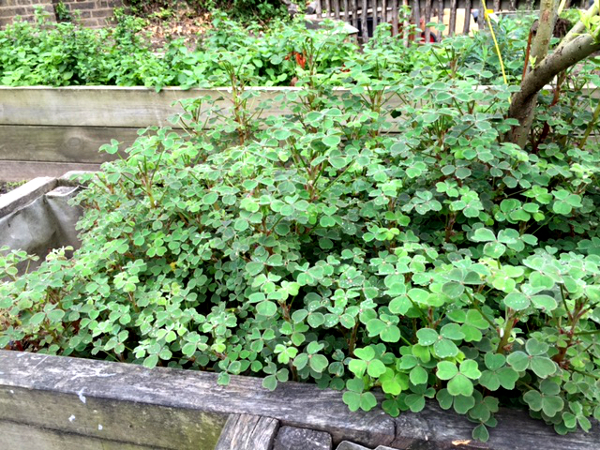 Photo: Oca growing in the garden at Bonneville Primary School in Lambeth in September 2015. Check out this great article on pupils succeeding with their Oca harvest in Barking. Amazing Christmas dinner serving Oca at Rosendale Primary School! You should any time now be thinking of harvesting your oca plants. 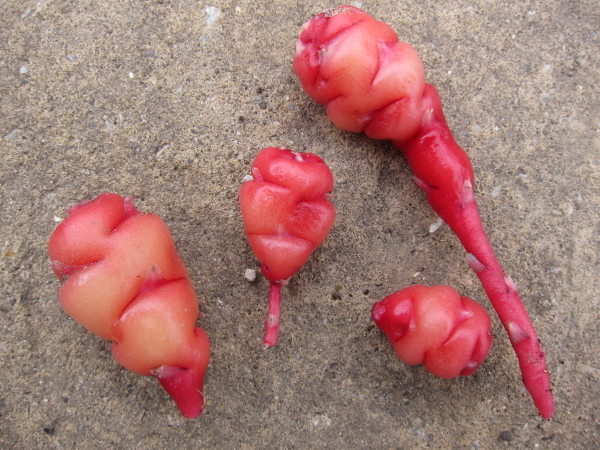 The recent frosts may have caused the leaves of your oca plants to have wilted and died. Don't panic as the frost was only short lived and should not have damaged the tubers in the ground but try to get them dug up in the next couple of weeks. Your plants may still be growing and the leaves will still look fresh. If you want to harvest the tubers now you could just 'lift' one plant to see how large the tubers have become. Don't be disappointed by their size, if you remember when you planted them how small they were. Whatever the result please take some photos of your crop and PLEASE fill in the results form and send them back to us (see below). This gives Garden Organic very valuable information about how well oca's grow in our climate, contributes to people science, and is great for student learning. E-newsletter special: Time to harvest your oca! (Nov 2015). We hope that every school that took part in the Oca experiment returned to fantastic looking gardens after the long summer holidays. For those growing the Oca which was sent in February hopefully it is growing well. Please remember it is not ready to harvest yet! The Oca tubers have not yet developed in size and will only do this as the daylight length shortens. What you can be doing now is to remember to water your plants well, at least once a week if we have a dry Autumn. If your plants are very tall and leggy, 'earth' them up like potatoes. That means get some good soil or compost and cover the stems so that only about 15cm of the top of the plants are showing. This will encourage more root growth and more tubers to develop and therefore a bigger crop. Harvest time - We will send you more information in November when it will become time to think about harvesting those wonderful tubers.